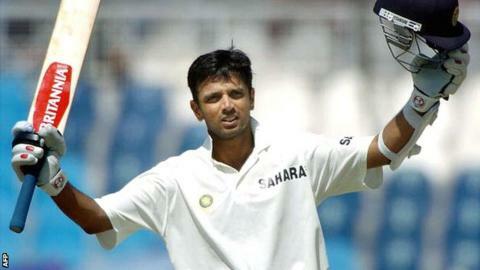 -A homage to Rahul Dravid’s cricket wake. If “gentle” in “the gentleman’s game” had a face, it would be Rahul Dravid’s. A middle-order batsman whose batting prowess and modest smile brought home the title of “Mr. Dependable”, Dravid has always been about stabilizing the most strained matches. His versatility is indisputable as is his commitment to the sport. The Indore born, Bangalore raised boy had played for the state of Karnataka at different levels such as under-15, under-17 and under-19 level. Accordingly, he went on to play the Ranji Trophy in 1991 before he went on to make his international debut against Sri Lanka in a one day series in Singapore in 1996.The proficient player did not have to look back since then. Dravid is the walking image of class and calmness. He has all been about minimum words and maximum performance. This is precisely why, a quick search about his career records shows a rather sizable list of achievements. Arguably, the best No.3 player for India in history, Dravid holds the record of facing the highest number of balls at the crease, more than any of his contemporaries, in his Test career spanning over 16 years. He is even the first batsman to have scored centuries in all 10 Test cricket playing nations. Moreover, being a spectacular slip-catcher, Dravid secured the world record for taking most number of catches as a non-wicketkeeper fielder in Test Cricket. He has even captained India with a resilient nerve that is typical of him. Dravid’s countless innings of glory that made him the top scorer for India in both the formats of the game between 2002-06 bear testimony to his effortless brilliance. His career nevertheless has been akin to an unsung hero, obscured by the more celebrated counterparts. Several honorary batsmen are indebted to him for their hundreds and double-hundreds.Dravid has been a quiet server who habitually put the team ahead of himself. However, he went through a dry spell individually when he started getting out to the left-arm quicks.That was a major dip in his form and repulsed him. He was dropped from ODI, although his caliber remained unquestioned. Dravid subsequently directed his matured wisdom in the IPL, where he captained the Royal Challengers Bangalore in the first edition, before being bought by the Rajasthan Royals in 2011. In what was to become his final visit to the holy grail of cricket-“Lord’s”, Dravid’s performance in the Test series instigated an ODI recall. But later that year, post a cancelled tour of Australia, the beloved Jammy of Indian cricket team called curtains on 9th March, 2012. Rarely can a player as polite as Rahul Dravid perform with such élan. Few could match his accomplishments, be it in or outside the cricket field! If you are intrigued by the gorgeous career of this Cricket legend and wish to learn more about him, make sure you check out Rahul Dravid’s profile on Xpert. Xpert helps direct all your questions to him or any celebrated individual of your choice. Xpert is designed to help turn our idols into our teachers. It is the largest Q&A platform having a knowledge database of all that our idols have spoken about.Xpert perhaps all that you need to learn from an expert.